I’m beginning to think only dietitians look at the Nutrition Facts Label on food packages. (It’s like leisurely reading for us. Soothing even.) The multitude of numbers can feel overwhelming to a mere mortal and many folks don’t even know which values are the most important to look at. You might be the exception, and if you are, well done! 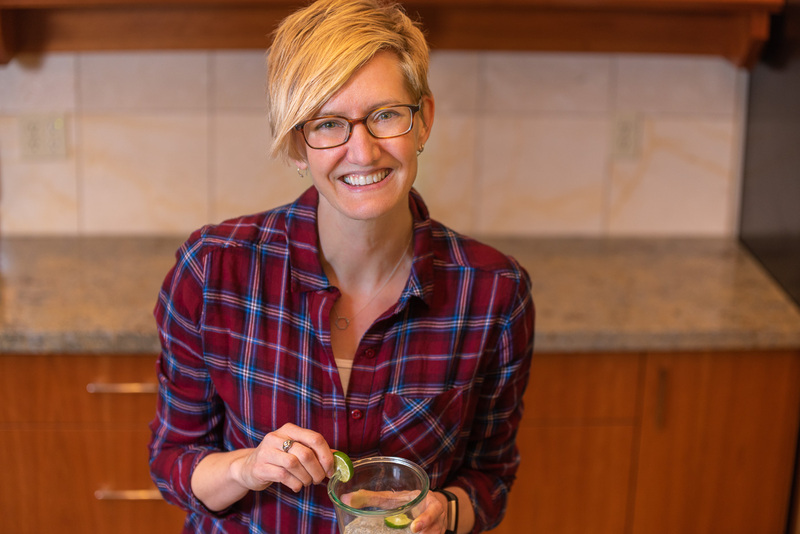 You’re using a tool designed to help you eat better, possibly gain or lose weight if that’s your goal, and potentially reduce your risk of chronic disease. If you’re not someone who’s in the habit of flipping the package over to peruse the numerals, this post is for you. With a few tips and a handful of visual comparisons, I’m hoping to convince you that looking at labels is fascinating, practical, and worthwhile even; especially for staple foods you regularly keep stocked in your fridge and pantry. Probably the most important place to start is with the serving size. All the values you see on the label for fat, fiber, etc. are based on that reference serving, like 1 slice, 2 pieces, or 1/2 cup. If you typically eat 3 servings or 1/2 a serving these values all need adjusting. And then we’re talking about doing math, which pretty much no one likes talking or thinking about, especially when they’re in a rush at the grocery store or in a rush trying to get dinner on the table. The place to look next is at the calories. 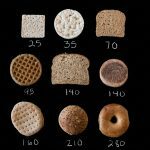 So today I thought I’d start simple with just this one value off of the labels and just one type of food: I’ll compare calories in a variety of bread, bun, and bagel choices to show you how they differ and how they’re similar. But wait a second…isn’t counting calories kind of old school? No way. It’s a time-honored technique that still works wonders. I know everyone these days is excited about intermittent fasting, and Paleo, and Whole 30 for better health and weight management but that’s just because they’re just the newest trends. I’m still a firm believer that calories matter. And I’ve got the science to back me up. OK, enough with the nutritional proselytizing. Let’s move on to the actual numbers. To start, just look at this spread from 25 to 280 calories. There’s quite a bit of variation among these bread-like items. A quick update before we officially compare calories: a new format for the nutrition label has been proposed. Unfortunately the deadline for implementation has been pushed back, and pushed back, and pushed back again. However, some manufacturers are voluntarily making the switch anyway ahead of schedule. So when you start reading labels of your favorite foods, you might see products with the old label and some with the new. 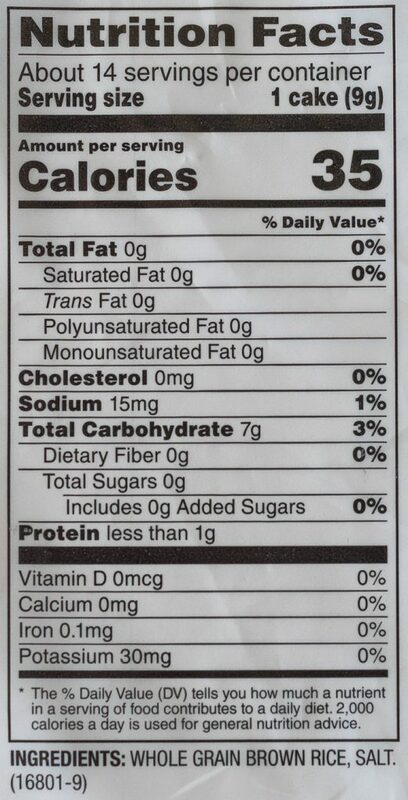 It just so happens that the FDA thinks that the two bits of information I feel are important (serving size and calories) should be supersized and/or bolded on the label to catch the reader’s attention. Compare the examples below of the old format and the new format. Serving sizes are tricky. What we think of as “one” bread or starch serving isn’t always in agreement with what food manufacturers or bakers think is one serving. You can make some smart and smarter choices by comparing products side by side, and I’ve taken the liberty of doing that for you…in pictures. First off, let’s look at buns. Veggie burgers are ever-present in our freezer, so burger buns are ever-present in our pantry. The first guideline to getting good grains is to opt for whole grains whenever possible, which I’ve done with all of today’s examples. The serving size on each is 1 bun, and they each hold 1 burger, but you can see there’s quite a difference in calories. 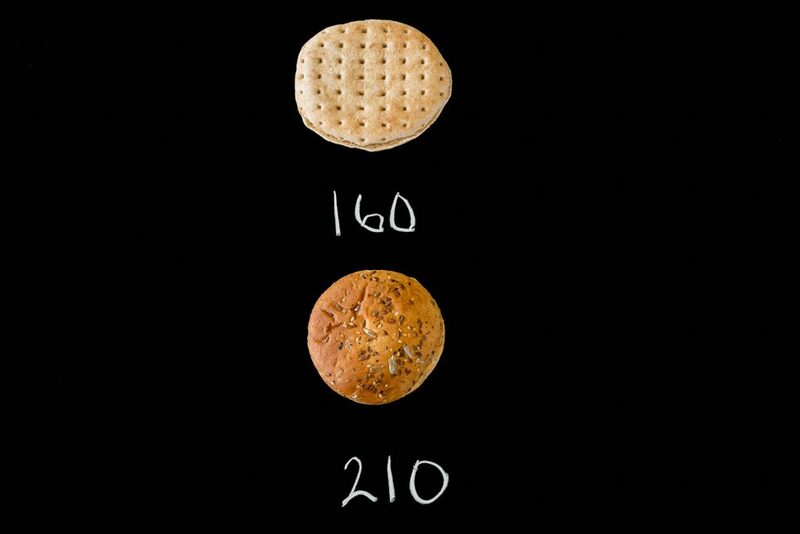 Both are whole grain products, but if your goal is weight loss 160 is better than 210. If your goal is weight gain, 210 is better than 160. Amiright? 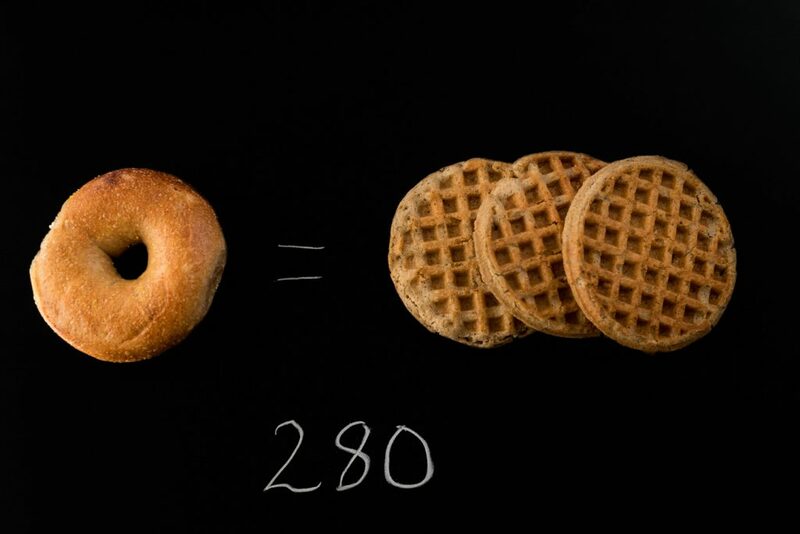 One 4-ounce bagel is 280 calories and one frozen waffle is 95. So for approximately the same calories, you could choose 1 bagel or 3 waffles. It’s commonly understood that we are happier with more food rather than less, or at least our eyes tell us we are, even if the actual values are equal. Getting to eat 3 waffles seems like a lot more chewing-derived happiness and satiety to me than 1 bagel. Or, in this instance if you could be happy with two waffles instead of two bagel halves, you could save yourself 100 calories. Should I point out that frozen waffles make a great bread substitute? Think about using them in other ways besides slapped on a plate covered in syrup. They can be quickly-prepared and portable breakfast “breads” topped with apple butter, tahini spread, or mashed avocado. Dave’s Killer Bread makes two sizes of loaves: regular and thin-sliced. The difference in calories is significant. Two small pieces have the same amount of calories as one large slice. Two large slices would give you 280 calories and two small slices would give you 140 calories. I’m no algebraic genius, but I’m pretty sure that’s half! So if you can be happy with a sandwich made on the thinner bread, think how much you’ll save! 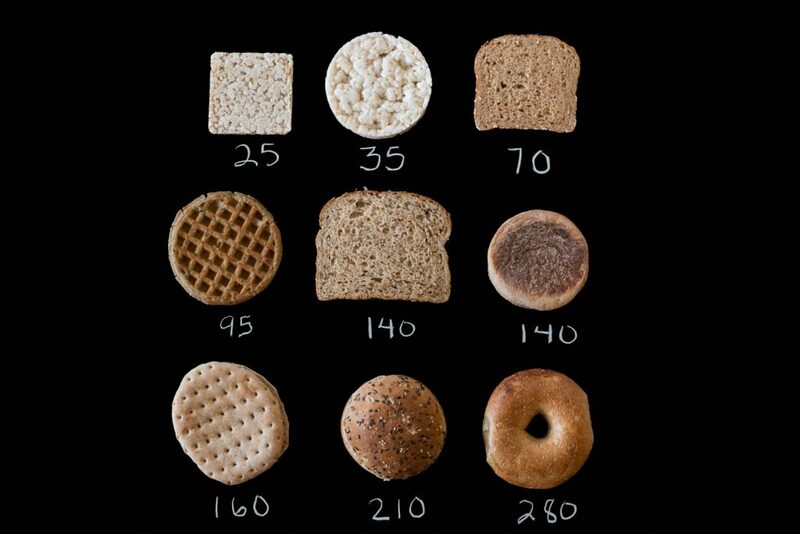 As you can see from the picture, an English muffin is similar in calories to the thin-sliced bread. So that could be a lower calorie option for making sandwiches, too. 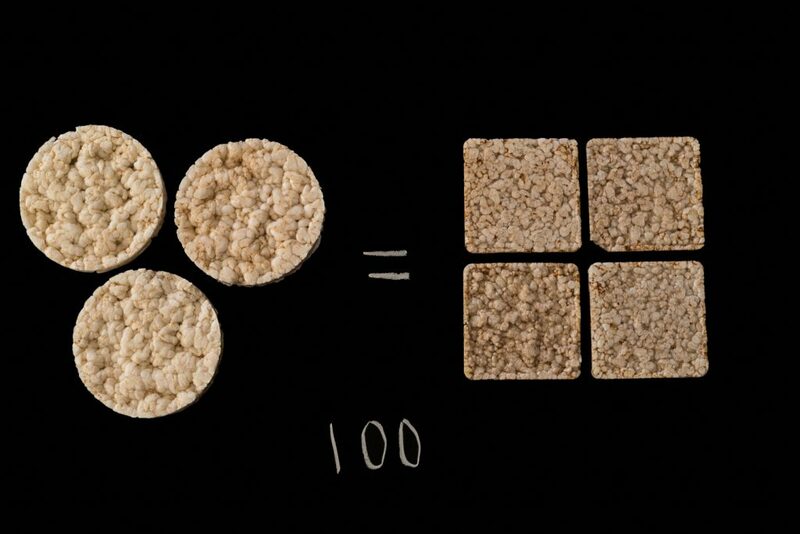 There isn’t a huge difference between rice cakes since they’re all pretty low in calories to begin with. When comparing these two versions, both made with brown rice, you can go with 3 thick ones or 4 thin ones and still only net 100 calories. With either option, there’s lots of spreading surface to play around with, whether you’re in the mood for natural peanut butter, homemade Nutella, hummus, or jam. 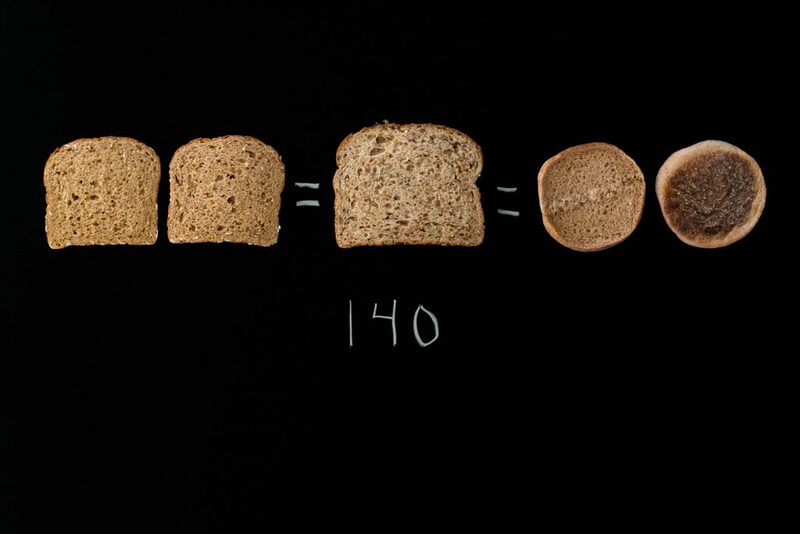 Did you see any of your favorite carbohydrates in these photos? Were you surprised by any of the numbers? Have you figured out a swap you could make to boost or minimize calories? Are you a visual learner? Did the pics make you hungry? When was the last time you ate? What did you have? Did you have anything to drink with it? Wait, I think I accidentally switched into nutrition counselor mode! So. Many. Questions. Let’s get back on track. Hopefully this post serves as a good reminder for you that there is valuable information pasted all over your groceries; all you have to do is look at it. If you’ve got a goal you’re working towards, these numbers could help you get there: less sodium to improve blood pressure, more soluble fiber to lower blood cholesterol, or managing calories to help manage your weight. You might start small. Pick up two packages of similar foods, breads or otherwise, and compare the key numbers side-by-side. What ends up going in your cart may evolve. Then what goes in your pie hole may evolve. Be careful though. If you start to enjoy reading the nutrient numbers too much, you may have evolved into a dietitian. Fess up. Are you a label reader, a label skimmer, or a flat-out label ignorer? What numbers would be helpful for you to peek at before you eat?